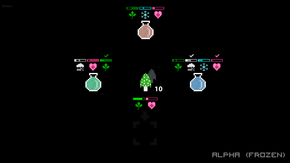 Potionous is a puzzle for those who love alchemy and potions! As a player, you will have to brew potions from various ingredients. 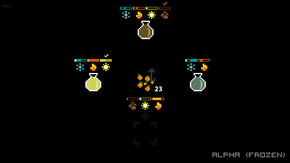 In every alchemy lab you will discover random set of ingredients and a goal — make three potions with specific effects. You'll need patience, strategic thinking and, of course, some luck. Simple controls: swipe left, right, up and down! 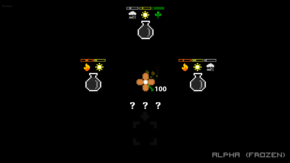 Pixel-art graphics: have you ever picked pixel mushrooms? 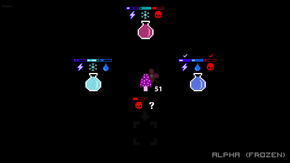 Randomly generated levels: new ingredients and goals every time! There are several types of ingredients with unknown effects. 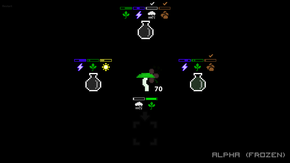 The global goal is to brew three potions before you run out of the ingredients. The potion is ready when all conditions are met (indicated by the check marks above the conditions). To research effects of ingredients, drag them down (the ingredient disappears, but one new effect is revealed). At the moment the game is in the early development stage. The current version includes only the main features to show the core gameplay. All feedback is welcome at .